Gary Spears from the Good Hope Lions Club recently made scholarship presentations to Miami Trace and Washington C.H. students. On the left accepting the check for Washington C.H. is Mallory Bihl and on the right accepting the check for Miami Trace is Carol Waddle. Each year the Good Hope Lions Club contributes scholarship money to three public schools in the surrounding area. Six graduating seniors from Miami Trace and six from Washington C.H. will receive a $500 scholarship. The Good Hope Lions also donated four $500 scholarships to graduating seniors from Greenfield McClain. The proceeds for the scholarships come from the Lions’ two pancake and sausage suppers and from the Christmas-time Lions’ Candy Store. 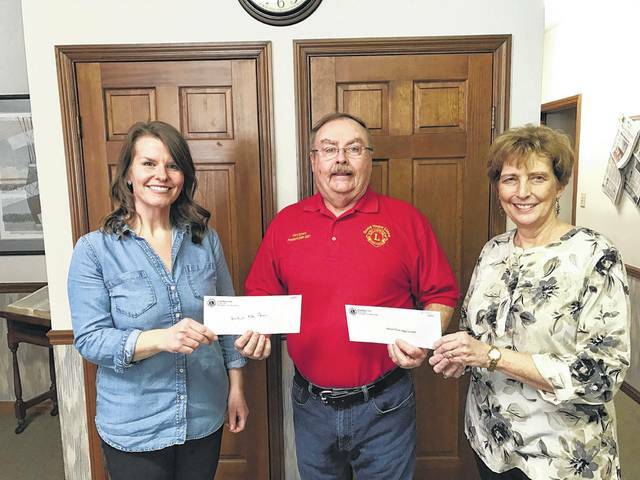 Lions Club members are dedicated in servicing the community with monetary support. More than $30,000 will be donated to community organizations such as Fayette County Food Pantry, Greenfield Food Pantry, Hospice of Fayette County, Meals on Wheels, the Diabetes Association, Easter Seals, United Way, Life Pregnancy Center, Fayette County Fair, Miami Trace ABC, the Community Health Fair, The Well at Sunnyside, Fayette County YMCA, Bread of Life, St. Vincent DePaul, Fire in the Sky, Miami Trace and Washington after-proms, Angels in Waiting, the Cystic Fibrosis Foundation, and the Hospital Foundation for Fayette Memorial. Donations also go to the Lions’ projects, such as the Sight and Hearing Pilot Dogs, Central Ohio Lion’s Eye Bank, the Ohio Lions Foundation, Ohio Lions Eye Research, SATH Camp Dovetail, Lion Quest, and the Ohio Blind Marching Band. https://www.recordherald.com/wp-content/uploads/sites/27/2017/03/web1_47595949-.jpgGary Spears from the Good Hope Lions Club recently made scholarship presentations to Miami Trace and Washington C.H. students. On the left accepting the check for Washington C.H. is Mallory Bihl and on the right accepting the check for Miami Trace is Carol Waddle.